Have you ever seen a car so completely totaled that you were shocked when you found out its occupants survived? "The front end is smashed like an accordion, the rear bumper is almost in the back seat, the windows are shattered, and all the air bags deployed! How could anyone walk away from this?" In fact, if you think modern cars are built "weaker" than vintage cars of the 1940s and 50s, you're absolutely right. Automakers discovered that cars with structurally stronger bodies were far more deadly to occupants than cars that were designed to crumple in a crash. The safety features in modern cars have come a long way. They are designed to absorb as much of the damage – or force – as possible during a car accident. We're all familiar with Isaac Newton and the famous falling apple. As a scientist and physicist, he set a foundation for our understanding of gravity and motion. An object in motion will stay in motion unless acted on by another force. 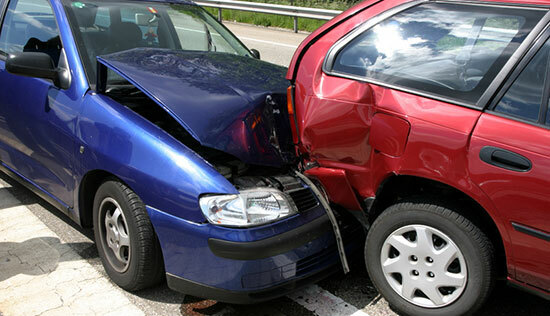 What Do Those Laws Mean for Crumple Zones? If a car is travelling at 60 miles per hour, then everything within that car is travelling at 60 miles per hour. If that car collides with an object, forcing it to quickly stop, the bodies within the car will continue travelling at 60 mph until something stops them as well. Force equals mass times acceleration. For an accident scenario, this means that the longer it takes to come to a stop, the less force the bodies within the car will feel. With crumple zones at the front and back of most cars, they absorb much of the energy (and force) in a crash by folding in on itself, much like an accordion. This delays the time to impact. As Newton's second law explains, this delay reduces the force that drivers and passengers feel in a crash. By reducing the force of impact, we reduce the potential damage to those riding in the car. Crumple zones, combined with properly fastened seatbelts and airbags, result in more lives saved each and every day. In the past, carmakers used to think that the stronger the car's frame, the safer it would be for its passengers. These cars didn't have crumple zones. What the manufacturers didn't consider was that the energy in a crash – the force after an impact – has to be absorbed somewhere. That energy can't simply disappear. Unfortunately, the force would be transferred directly into the cabin of the car and its next softest substance – the passengers. In many crashes in the past, cars would come away with less damage, but its occupants would be seriously injured or killed. This was because older cars lacked the ability to delay the impact, which – as we know from Newton's second law – reduces the force on those inside. Thankfully, engineers, physicists, and scientists came together to design safer and more crash-resistant cars. 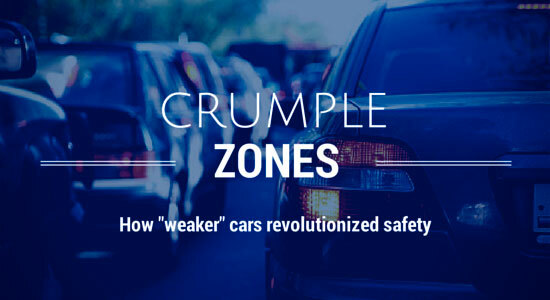 Every car in production today is designed with crumple zones, among other standard safety features.